How to make this curly 'R' (ℛ)? Which package has a similar looking fancy R or does anyone know how to make one? (Note: the line underneath the R is just the notebook paper... this is from a scanned set of notes). In the modern toolchain with unicode-math, you can set any TrueType or OpenType font as your script alphabet (or calligraphic, or a new alphabet). For this example, I downloaded the OTF version of Odelette by Adi Marwah into a subdirectory of my project folder named fonts. You can consult Table 307: Math Alphabets on page 119 of the comprehensive list for other options. If you could obtain a higher-res image of it, or better still an image in vector format, then this approach would work for most situations. However, it is impervious to things like \textit, \textcolor, etc. If you prefer there is also this font TeX Gyre Pagella Math for the character bit curly R.
Not the answer you're looking for? Browse other questions tagged math-mode fonts symbols or ask your own question. How to make a command for a composed symbol to work with all font sizes? How do I stack more than two arrows in math mode? 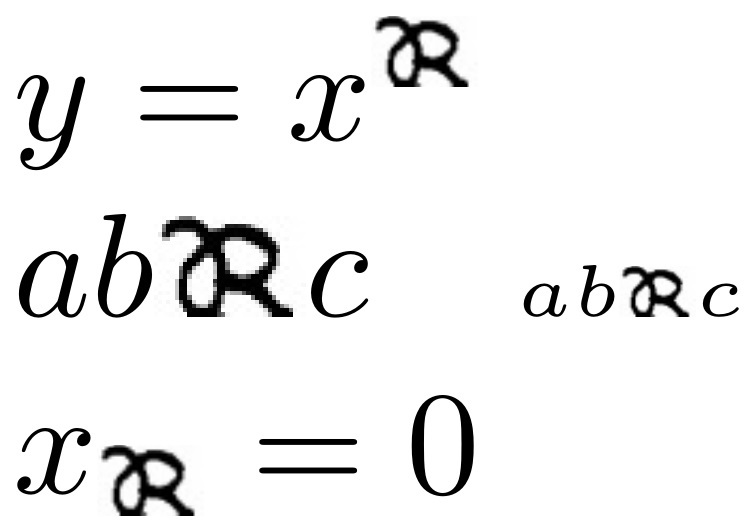 How do I find a LaTeX font with an upper-case cursive letter Z? How to change code example font in listings? Special square root for complex numbers?